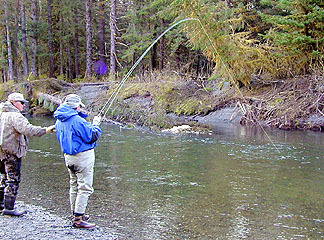 Three of us - myself (Roger Finke), Larry Duarte, & Frank Coleman, fished the Situk River near Yakutat in Southeast Alaska last month. This is the stream Mike Fong highlighted in his last presentation to the club. We overnighted in Seattle so we could be on the first flight to Yakutat in the morning, and arrived there @ 11 AM. Our guide picked us up at the airport, got us settled at his lodge, and had us on the river by 1 PM! Since the sun doesn't set until 10 PM, we had a full day of fishing the first day. We all caught fish every day, from a max of about 10 (one tends to lose track after the first 5 or 6, so I'm not sure about that max number) to a minimum of 1!. On one day I know I had at least 8 hookups by 9 AM, but I'm not sure what the total number for the day was, and on another day I didn't get a hookup until we were just about ready to quit for the day! Everybody had good and bad days, so everyone had plenty of hookups. The weather was a good/bad news deal. The prior 2 times we have made this trip, the weather has been very consistent - every day 40 degrees, and it rained all day and all night. This year, not a cloud in sight & 55 degrees all day. The bad news is that the number of fish we caught was much less than before - the guide was praying for rain every day! The fish were also somewhat smaller than in other years, ranging from 24" to the largest we measured of 31", whereas in prior years we have measured fish up to 37". Another thing related to the weather I think is the number of bald eagles we saw - they seemed to be everywhere. At one point we drifted under a tree with 8 mature eagles sitting in it! Our guide, Frank Devereaux, also has an oceangoing boat, so we spent one day halibut fishing for a change of pace. 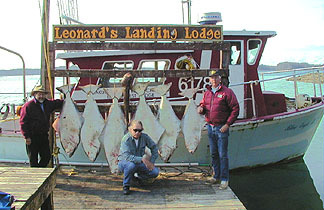 We limited (2 apiece) on fish from 75 to 150 pounds, and brought back 290 pounds of halibut fillets. 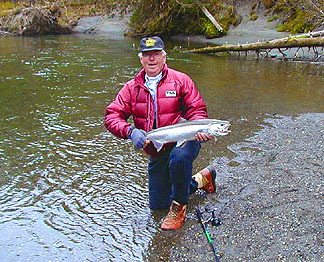 On the last day we were on the river by 6 AM, fished as long as we wanted, and caught the 5 PM flight back to Seattle. A very good trip!